While Samsung's high-end fleet of curvaceous Ultra HD tellies have been generating plenty of noise this year, the brand's real volume comes on the back of its 6 Series screens, which is where the 40-inch H6400 model fits in. These mainstream HD models will be the sets that most of us turn to when we want a Smart TV upgrade, thanks to keen prices, adventurous spec and a high level of performance. Reflecting their broad appeal, this year's H6400 models are available in 32-, 48-, 55 and 65-inch screens sizes, in addition to the 40-inch UE40H6400 featured here. And with it being a World Cup year there's even a Soccer mode on board. 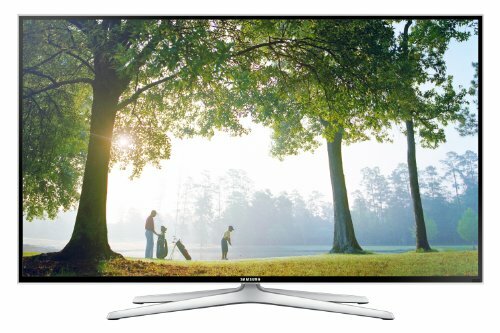 Does the Samsung UE40H6400 score a spectacular goal in its category or is it more Championship than Premier League? The H6400 is a classic Samsung flatscreen design from the brand, with translucent edging and chromed X-wing pedestal stand. Connectivity is expansive, comprising four HDMIs - one of which is ARC compliant for easy audio sync output to an external device, such as a soundbar - alongside component/composite inputs with accompanying stereo phono audio, old school Scart and three USB sockets. There's also a digital audio optical output, headphone output and common interface (CI) slot. The set also sports a single Freeview HD tuner and Wi-Fi is integrated. This isn't the thinnest of screens, it must be said, measuring the best part of 50mm at its deepest. However, the set bulges to accommodate two downward firing stereo speakers, so we can't carp. Resulting audio clarity is fine, with enough mid-range roundness to prevent a reoccurring need for Nurofen. Flatscreens can often lack sound with oomph, so it's an important feature here. Two remote controls are supplied: a standard infrared doofer and a pointy Bluetooth pebble, the latter dubbed the Smart Touch Control. With a touch sensitive pad and gyro sensor, plus integrated microphone for voice control, the Smart Touch Control can be used to change channel or volume, open apps or search for movies and TV shows. If you need to call a full complement of menus, then a hot key will pull up a virtual onscreen keyboard. Samsung's Smart Hub features a few new additions over last year's F6400 screens, including a Timeline thumbnail TV guide built around recommendations derived from viewing preferences, and a Trending window which appears to offer a largely random selection of programmes (Made in Chelsea, Hollyoaks, Orphan Black, Top Gear). It's all a bit pointless. Quite how moving social media from a personal device to a communal one is beneficial to anyone remains to be seen. Samsung's Smart Hub also now offers a slate of causal games. Multimedia support across a local area network (LAN) and from USB is wide, which is useful. The set can play a variety of multimedia codecs and containers, including MKV, MOV, AVI and WMV files; audio playback covers WAV, FLAC, MP3 and WMA. If you don't run a NAS (network attached storage) drive on your network, then there's also the option to access content from Samsung cloud storage, although you'll need to set up a dedicated account for this. Menu navigation is sprightly. The TV features a Quad Core processor, the same as that which debuted higher up Samsung's telly range last year. Consequently, everything is nicely responsive. The Samsung H6400 delivers extremely good picture quality, given the price point of this set. There's a high level of detail evident in HD sources and overall colour vibrancy is high, no doubt thanks to a proprietary Wide Colour Enhancer Plus algorithm. Of the picture mode presets provided, we found Standard and Movie options offered good out-of-the-box performance. The H6400 also has an LED edge lighting system which actively illuminates the screen for increased contrast. Dark scenes are rendered smooth without light pooling in corners, while dark shadows are free of pixel noise and blotchiness. It's a good result, although there's no fancy local dimming at work here, so blacks aren't pitch. They are convincing enough, particularly when viewed in room with some ambient light, which amplifies subjective black depth. Samsung rates the set with a CMR (Clear Motion Rate) of 400, which is little more than entry-level. However motion resolution is terrific provided you select the correct interpolation setting. Motion Plus Clear will deliver a full 1080 lines of moving resolution with no overt artefacts interrupting the picture. Alternatively, fiddle around we with settings using Motion Plus Custom - we put Blur Reduction to eight on the scale and Judder reduction down to zero. That was our go-to option for sport and general entertainment. The panel looks fine with Motion Plus turned off too, which is good news if you dislike the "soap opera effect" where movies seem to turn into Eastenders due to that high frame rate image processing; subjective motion resolution without processing is around 800 lines. While many of the picture processing modes on offer are superfluous, Black Tone and Dynamic Contrast can be worth experimenting with. Watching Amazing Spider-Man on Blu-ray, Spidey's outline looks more defined in the scene where he surprises the carjacker in the dark ("My weakness! Small knives!") thanks to Dynamic Contrast. This can be further enhanced by applying the Dark Tone (use the "Dark" setting) for slightly greater image depth. However, we would suggest you avoid using LED Clear Motion altogether, which darkens the image and adds flicker. Other features include a second generation Soccer mode, which includes a dedicated picture preset supposedly optimised for Sport. But it's seriously horrible, rather like a rowdy dynamic shop mode. It can, however, auto-record match highlights to a USB device, triggered by crowd noise, which is nothing if not novel. The set can also Screen Mirror your Android phone using Miracast, and there's a Wi-Fi direct mode for non-network wireless hook-up. While the UE40H6400 is Full HD Active Shutter 3D compatible, and two pairs of lightweight 3D glasses are supplied, we didn't find the viewing experience particularly great. We noticed quite pronounced crosstalk double imaging, with the menu sequence from Tangled looking like the invasion of the phantom lanterns. The panel's slow refresh rate means that live stereoscopy never feels particularly comfortable to watch. Given that the 40-inch screen size is too small for 3D to be anything other than a curiosity, this is probably not a major concern. Overall, the Samsung UE40H6400 is an alluring 40-inch telly. It combines a sharp, contrasty high definition image with a well stocked Smart Hub and selection of apps and catch-up services. There are some other caveats, however, such as BBC iPlayer and Demand 5 absent at the time of writing (confirmed to arrive at a later date), an entry-level refresh rate not lending itself well to 3D and a panel that can't quite deliver pitch blacks. But all that's not enough to prevent our thumbs from pointing skyward. The thing that will largely make the H6400 appeal is its price point. At around £800 the crowd-pleasing design and audio performance make this a well rounded choice. If you're after a Smart TV at a fair price and couldn't give a hoot about 3D then this Samsung scores well.